Pig trees. By definition of my sisters and I, they are the common cherry blossom tree. They captivated us on a trip out west to Vancouver when we were younger, we had never seen such a beautiful sapling. Growing up in Calgary we have coniferous trees and the dreaded Poplar which sheds it's despicable sticky seedlings all over the ground each year. The fluffy pick and white blossoms blowing in the wind were so breathtaking. They instantly were one of my very favorite highlights of the city I was blessed to call home for a few short years. I even have permanently and painfully added them to my tattoo collection. Along with great vehicles, TV's and sushi, we have the beautiful country of Japan to thank for our trees here in Canada (you can read about the history of the trees gifted to us here). Japan this week has suffered one of their worst disasters in history with the 8.9 earthquake and the tsunami that followed. The images are heart wrenching and unbelievable. The Japanese are proud and beautiful people and we have watched as they deal with this horrific occurrence with grace and calmness. It's really hard to think of anything but them at this time. 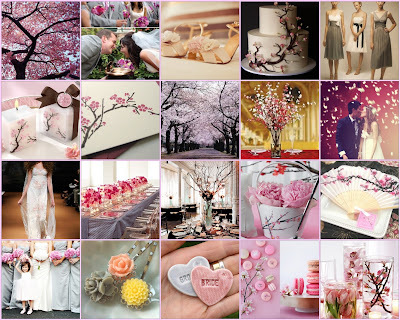 The Japanese national treasure, the Sakura, makes for a gorgeous starting point for colours and florals for a wedding. They are soft and pretty and can be combined with several accent colours to create a very vivid look, or a softer, feminine feel. However you use them, make sure you whisper a little "thank you" to beautiful Japan for giving us something so stunning.